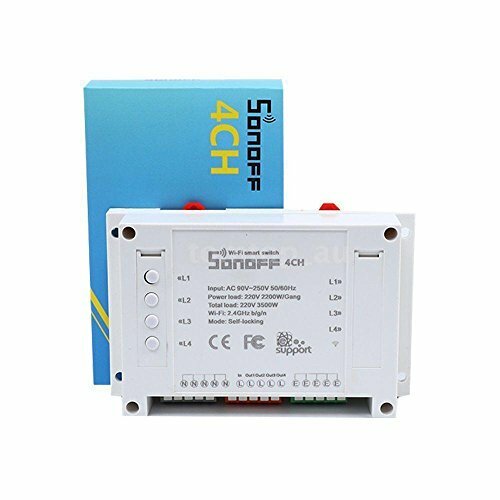 Sonoff 4CH 4 gang light switch supports to connect and control 4 electrical appliances, which can be turned on/off separately by the buttons or iOS/Android App(eWeLink). Owning a Sonoff 4CH multi gang switch means you have 4 Sonoff basic Wi-Fi switches integrate together. The enclosure is din rail mount supported. A DIN rail is a metal rail of a standard type widely used for mounting circuit breaks and industrial control equipment inside equipment racks. These products are typically made from cold rolled carbon steel with a zinc-plated or chromated bright surface finish.